Dudley Senanayake, the reluctant politician, entered the political fray at a young age; he was only 25. It is believed that his father’s gentle persuasion and constant advice by his friends and other members of his family were finally successful in making him take the plunge. But, looking back at his public life from 1936 to his demise in 1973, one wonders whether the intrinsic love and affection he showed for his countrymen throughout his public life was the hidden force that persuaded him to enter politics. He was born on June 19, 1911. This year his birth anniversary falls on Poson Poya. Incidentally June 19, 1911 was also Poson Poya. He was born in the village of Bo-thale, the meaning of which is the village of the Bo-Sapling, in Mirigama in the Gampaha District. However, he did not enter the State Council from the area of his birth as that electorate was represented by his illustrious father. He represented the adjoining Dedigama electorate in the Kegalle District. It became vacant with the demise of Sir Francis Molamure, a powerful politician. Dudley Senanayake stuck to the principle of ‘fairness’ throughout his life. He was not a blind follower of anybody, not even his father, even though his father was a powerful and a widely respected leader. As the leader of the House, D.S. Senanayake threw his entire weight behind the British during the War. He felt that in this battle between the Fascists led by Hitler and the free World led by the British, it was the proper thing to do. Moreover, he was of the opinion that such action will surely will make the British Government more amenable towards Ceylon (Sri Lanka) in its Independence struggle. However, the young Senanayake had other ideas. He was of the opinion that the British were an occupying force and that we should not be a party to the war. On a number of occasions, the young State Councillor, acting according to his conscience, found himself on the opposing side of his father and that disturbed him deeply. Unable to come to terms with this predicament, he informed his father that he intends to give up his political career. To his surprise, his father advised him not to entertain any such thoughts, but continue to act according to his conscience and that as far as he was concerned he was more than proud to witness his son acting according to his own convictions. In 1952, with the death of Prime Minister D.S. Senanayake, a crisis emerged in the Government. Since S.W.R.D. Bandaranaike, a powerful founder member of the United National Party and more or less the second in command, had crossed over to the Opposition in 1951, Sir John Kotelawala emerged as a contender for the leadership. However, the Government Parliamentary Group was not amenable to Sir John becoming the successor. Instead, they chose Dudley. Sir John was furious, Dudley, however, refused to accept the post, saying that it should be offered to the next in line. All negotiations failed as some members of the Government Group threatened to cross over to the Opposition if Sir John became Prime Minister; the very existence of the Government was threatened. The crisis was somewhat resolved by Dudley Senanayake, under tremendous pressure, agreeing to form the Government and Sir John agreeing to serve in Dudley’s Cabinet. The new Prime Minister insisted that he should be allowed to dissolve Parliament and obtain a fresh mandate and did so just thirteen days after he was sworn in as Prime Minister. Not only did he win this election, he won it quite convincingly by getting for the first time a two-thirds majority in Parliament. It was well known that Sir John agreed to serve under Dudley because, his mother whom he loved so dearly, persuaded him to do so. However, this grudging acceptance did not last long, it finally blew up with the publication of an anonymous document called, ‘The Prime Minister’s Stakes 1952′ supposedly authored by Sir John, where he accused Dudley of all kinds of villainy. Even though this matter was settled amicably, plagued by harassment, conspiracies and illness, in 1953, Dudley resigned as Prime Minister and announced his retirement from politics. In the long history of ours, there are only two leaders who had abdicated power; one was the great King Sirisangabo and the other was Dudley. Both chose to do so when they were at the peak of their popularity. In 1956, one year before the due date, Sir John dissolved Parliament with the hope of returning to power with the majority he inherited from the former Prime Minister. But he was rejected by the people; the UNP was decimated to a mere eight seats and was unable even to claim the post of Leader of the Opposition. Shaken by the result, senior UNP members appealed to Dudley Senanayake to come back to lead the party. After much persuasion, Dudley Senanayake agreed to accept the leadership on the firm understanding that Sir John Kotelawala ceases to hold any position in the Party and in 1957, Dudley found himself leading the party once again. Just three years after assuming the leadership, Dudley was successful in making the decimated UNP the largest party in Parliament. However, as he could not muster an overall majority, he was of the opinion that the leader of the next largest party which was led by C.P. de Silva, should be allowed to form the Government. He intuitively knew that such a Government would collapse before long and the UNP would return to power with an absolute majority. But, the majority members of his party had other ideas and he was compelled to form a minority government. What transpired thereafter forced the UNP to the Opposition. The left parties in Parliament formed a coalition with the SLFP that was led by C.P. de Silva. Soon Sirimavo Bandaranaike, the widow of S.W.R.D. Bandaranaike, became its leader. The introduction of Mrs. Bandaranaike into politics leading this powerful coalition was instrumental in defeating the UNP at the general elections that was held three months later. Dudley became the Leader of the Opposition. The deputy Prime Minister C.P. 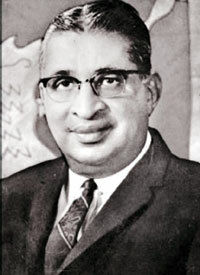 de Silva who was always uncomfortable with the presence of left parties in the Government, joined the Opposition in 1964, forcing the Government to lose a crucial vote in Parliament. In the general elections that followed, the UNP with the support of seven parties received an overall majority. However, since it was C.P. de Silva who was mainly responsible for bringing down the Government, Dudley offered him the Prime Minister’s post. This offer was turned down but he opted to serve under Dudley. Thus Dudley became the Head of Government for the fourth time. The new government that was formed in 1965 was the first Government to run its full term. It was a remarkable achievement considering the fact it comprised almost all shades of political opinion. The right of centre UNP led by Dudley Senanayake, the left of centre breakaway SLFP led by C.P. de Silva, Father of Marxism Philip Gunawardene, Tamil parties — the Federal Party led by S.J.V. Chelvanayakam and Tamil Congress by G.G. Poonambalam — and K.M.P. Rajaratne leading a Sinhala Group. It was truly a National Government. The main reason for the Government to last its full term was the undeniable faith and respect Dudley enjoyed among all those groups. Philip Gunawardene who was known as the ‘Father of Marxism’ in Sri Lanka, was a powerful opponent of the UNP. Yet, he joined Dudley Senanayake in opposing the coalition led by Mrs. Bandaranaike. This powerful politician who commanded major support in the sixties was somehow reduced to only one seat in the Parliamentary Election of 1965. Only he was returned to Parliament. But as soon as Dudley Senanayake was sworn in as Prime Minister, he called on Philip Gunawardene and requested him to join the Government as a personal favour to him. Mr. Gunawardene was overwhelmed and agreed. These two political giants who were once bitter political enemies became inseparable friends. The Dudley Senanayake Government brought about much needed communal harmony to the country. Communal tensions that arose in 1956 and its reappearance periodically, ceased during the tenure of the new Government. His visit as the head of Government to Jaffna, which later became the hot bed of communal violence for many decades, witnessed a sea of heads thronging to welcome him and the Prime Minister being carried on the shoulders of the people with the security personnel unable to get near him. It was a fantastic sight that one cannot even imagine happening today. Dudley was accused to being partial to the Tamil minority community because he proposed to establish District Councils which were decentralised administrative units, functioning under the control of the Government. The new Government was committed to uplift Agriculture. Like his father, Dudley believed that the Nation’s well being is linked to food security, and he travelled the length and breadth of Sri Lanka to provide the proper impetus to agriculture. Mahaweli diversion was a massive irrigation feat inaugurated during his time. But before its completion his Government was defeated at the 1970 elections. Dudley was a simple man. Even as Prime Minister he was often seen driving his own vehicle, visiting his friends or attending to a private errand, without any security personnel accompanying him. Many are the instances when his security was instructed not to follow, as he was on a private mission. Nevertheless, the police secretly followed at a comfortable distance and was quite satisfied with this arrangement as they were aware of the places he used to visit. One day to their shock he could not be located and a frantic search ensured, only to find the Prime Minister strolling on the beach at Hikkaduwa taking photographs. Photography was his passion. Dudley was also a great lover of golf. On one occasion, he instructed the security not to follow him saying that he was going to Nuwara-Eliya to play golf. As usual the police started following keeping a comfortable distance. He was driving his own vehicle and at Ramboda Pass the radiator started to boil and the car had to be stopped. The Prime Minister parked the car and sat on a culvert nearby and waited for the engine to cool down. The police unaware of this development arrived at the scene a few minutes later and was shocked to see Prime Minister seated on a culvert. Dudley quietly got up, thanked the security for following him and rather embarrassingly asked them to take him to Nuwara Eliya. Such was the simplicity of the man. Men who love honour, men who cannot lie. Extrovert among friends but an introvert in unfamiliar company, Dudley was somewhat a shy personality. He hardly smiled at an unknown person but readily reciprocated. On one occasion, his sister-in-law told him that as a politician he should go out of his way and smile with people but Dudley shrugged and said ‘What if they do not recognise me? They will think that I am mad’. Such was his modesty. In 1970, the Government was defeated at the general election. Even though the UNP as a single party secured the highest number of votes in the country, the prevailing electoral system denied the party the majority in Parliament. Dudley did not wish to accept the post of the Leader of the Opposition. Instead he handed it to J.R. Jayewardene who was then the de facto deputy leader and he remained as only the member for Dedigama. Though he wished to retire from politics, tremendous pressure brought about by his supporters denied him that opportunity and he found himself leading the UNP campaign in four by-elections that were held subsequently. The UNP managed to win two out of the three electorates that were represented by the then United Front Government. Almost every morning Dudley drove his own vehicle and went to play golf. On one occasion, when he stopped for the traffic lights, three youths in the vicinity started jeering him. He quietly alighted from the vehicle, walked up to them and said that he lived nearby and that he always took this same route to go to the golf club. He asked them to do the same thing in six months’ time if they felt that he deserved it. In six months’ time, Dudley was no more, but the three youths concerned were seen crying near Dudley’s coffin apologising for what they had done. When he died in 1973, he was only an Opposition MP, yet huge crowds from all over the country flocked to Colombo to pay their last respects to this great man. For miles and miles people queued for long hours to get a glimpse of his body. The London Sunday Telegraph in the front page referring to his funeral carried the headline “4 ½ Million pay homage to Dudley Senanayake”. It is interesting to note that this was more than one third of the population of Sri Lanka at that time. An unknown admirer, who stood in a queue for more than nine hours, walked up to the casket and laid a wreath penned with the question, “O my leader, please answer me. This perhaps explains more than anything else the love and the admiration people had for him. The 37 years of his public life were enshrined in integrity that earned him the undying respect of friend and foe alike. Born to an influential family, he moved with kings but was humble enough to be comfortable in the company of a poor villager. Honesty and simplicity were two virtues the people saw in him and admired greatly. Dudley Senanayake will never know how the people of this country reacted to his death, the sadness and the sorrow that engulfed the nation. Those who witnessed will never live to forget it. To those of us who had the privilege of knowing him, his memory, even after 43 years of his demise, still continues to bring a tear to our eyes.